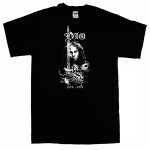 The American heavy metal vocalist and songwriter, was famous for his performance in Black Sabbath and his self titled band Dio. Other bands in which he drew fame were Elf, Rainbow, Heaven & Hell. He was considered as one of the most powerful singers in the history of heavy metal. His unique powerful voice was basically the key factor behind the success of various bands in which he had performed. He is often ranked as one of the greatest rock and heavy metal vocalists of all time. Ronnie is often credited for popularizing the metal horns gesture in the heavy metal culture. Ronnie was working for Heaven & Hell with his former bandmates of Black Sabbath who came up with their only studio album together titled ‘The Devil You Know’ in the year 2009. Ronnie James Dio died of stomach cancer on May 16, 2010. The last song that was recorded by him was ‘Metal Will Never Die’.